Women are nearly twice as likely as men to develop Alzheimer’s disease, according to a new report published by the Alzheimer’s Association. While a 65-year-old man has a one in 11 chance of developing the disease as he ages, a 65-year-old woman has a one in six chance. The report states that more than three in five unpaid Alzheimer’s caregivers are women, and among female caregivers who also work, 20 percent have gone from working full time to part time because of their caregiving duties. Lead a healthy lifestyle. This includes adopting a healthy diet full of fruits and vegetables, lean proteins, whole grains and low-fat dairy. You should also keep physically active, incorporating cardiovascular activity into your daily routine. Keep your cholesterol, blood sugar and blood pressure within healthy limits. See your doctor regularly to check all levels. Stay mentally active. Make sure your brain is always working. 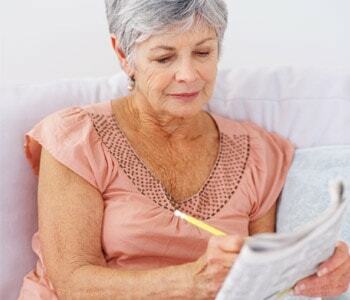 Do crossword puzzles, read books and magazines or take up a hobby that requires you to think. Stay socially active. Do not isolate yourself. Make a point of seeing other people regularly – especially if you are retired and do not have a job. Schedule daily phone conversations and participate in community activities.